How do we measure improvement? 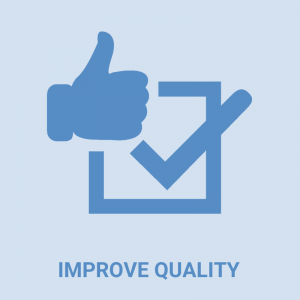 A continuous quality improvement system enhances classroom quality and leads to better child outcomes. Just as we encourage children to master new skills, we expect adults to improve and enhance their own professional skills. To ensure public pre-K programs are as effective as possible, a system to assess program quality and external accountability is essential. Beyond monitoring programs, a continuous quality improvement system (CQIS) requires that each classroom receives an annual structured observation of classroom quality in order to gauge quality on a valid and reliable measure, and critically, information from the observation is used to help teachers improve their classroom practices. Implementing a CQIS requires the use of a structured classroom observation tool. The three greatest cost drivers are the conducting of the assessments; establishing a system to ensure the reliability of the observations; and developing a system to collect and share the data with the pre-K program. It is recommended that classrooms be assessed annually to increase the probability that ratings would be valid given the high staff turnover in early childhood programs. Assessors are either employees of the state or contracted by the state to conduct observations. Even if they are contracted by the state, it is assumed that the state allocates resources to oversee the activities of the third party for quality assurance purposes. In order to guarantee the reliability of the assessments, the person conducting the observations must be trained to reliability which may be an additional cost for the state. Even if the state is not providing the trainings, costs associated with assessor’s reliability testing or a data system to maintain assessors’ qualifications and status may be incurred by the state. Finally, in order to support programs in using the data for quality improvement as a continuous process, a system needs to be established to share the assessment results as the site level. The state might also provide technical assistance to pre-K program administrators to understand the assessments and how to use the data in developing an improvement plan at the site or classroom level. Research suggests CQIS can improve classroom practices related to high-quality experiences for children. “Continuous improvement” is an attitude that avoids blame and encourages excellence, teamwork and creativity. A CQIS codifies these attributes in practice that can be assessed and adjusted to enhance early learning outcomes. Research suggests CQIS can improve classroom quality leading to positive child outcomes by focusing on active supports for good teachers to provide engaging, intentional and individualized education for every child. NIEER benchmarks require that all classrooms receive annual structured observations on a valid and reliable measure, and that the information collected is used to help teachers improve their practices. We know poor quality can render preschool programs ineffective at best, or even harmful. Research shows states must do more to support quality beyond providing adequate resources. CQIS is worth the investment because it is critical to maintaining quality.